It's Writing Wednesday. To look for examples of picture book stories that are considered top notch, one place to check is the Cooperative Children's Book Center's annual Charlotte Zolotow Award winners. It's the major award for excellence in picture book story writing. 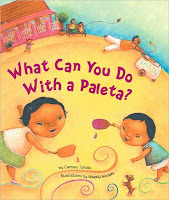 This year's winner is What Can You Do With a Paleta? by Magaly Morales. There are also plenty of honor books and recommended titles here. These books would be well worth checking out from the library and studying. Not to mention fun, too!